What’s the Difference Between 1500, 2500, and 3500 Trucks? You’ll see the 1500, 2500, and 3500 designations used across popular manufacturers, including RAM, Chevy, GMC, and Ford, but it’s common not to understand what they may mean. Here’s a rundown on the distinction between these pickup types to help you choose a new truck for work or pleasure in Douglas County. You’ll still sometimes see 1500 trucks referred to as half-tons, but these days, those labels don’t really describe the trucks’ true abilities. Instead, the 1500 is a light-duty truck, while the 2500 and 3500 are heavy-duty trucks. The 1500 is commonly used for light work and general driving – say, general service work around Villa Rica – while the 2500 and 3500 are preferred by Carrollton service workers who need to tow and carry heavy loads. 2019 RAM 1500: Chrysler, Dodge, Jeep, Ram’s light-duty truck still commands up to 396 hp and 420 lb-ft of torque, plus up to 10,640 lbs. of towing and a 1,900 lbs. maximum gas payload. With the highest owner loyalty of any truck, it’s ideal for most Carrollton and Coweta County drivers. 2018 RAM 2500: Harnesses up to 410 hp and 429 lb-ft of torque with its gas engine and offers a 17,890 lbs. tow rating with its available 6.7L Cummins Turbo Diesel. That’s more V8 horsepower than the Ford F-250. The latest Ram 2500 was even named 2018 Heavy Duty Pickup Truck of Texas. 2018 RAM 3500: Makes up to 900 lbs-ft of torque while offering a 7,390 lbs. max gas payload and 31,210 lbs. max diesel tow rating. Its line-leading towing capability is a highlight in RAM 3500 reviews. It’s your go-to for heavy-duty work in Coweta County as well as for premium interior comfort. 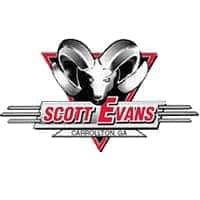 For more information on the RAM 1500, 2500, and 3500, as well as what separates them from each other, take the trip from Douglas County to Scott Evans Chrysler Dodge Jeep Ram. Our experienced staff and great deals make it worth the trip. Check out the differences between Dodge and RAM to help you make your decision! 0 comment(s) so far on What’s the Difference Between 1500, 2500, and 3500 Trucks?